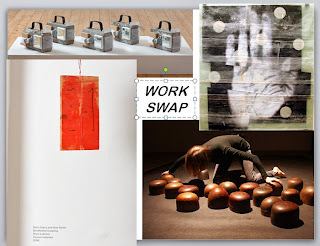 HYPOTHETICAL EXCHANGE + CONNECTION: Supplementary#1 The Work Swap ? As one of 5 optional supplementary gestures I am suggesting that myself and fellow exhibiting artist Lovas Ilona (HU) swap one work of each of ours to place in each other's gallery space. If she wants to, I propose that we each pick a small work, perhaps one of a series, that can be sited somewhere, as with other artworks in the selection, the positioning decisions have been devolved to the discretion of the architects. Of my own works I offer either on from the series 'Popular Problems' that can be ploaced on the floor anywhere, or 'Blindfolded Sculpture (Red Board)', an oblong of wood (that was hand-painted, drilled, marked with pen, and suspended with string, all whilst blindfolded) that hangs down at eye-height from the ceiling.